Following 47 days of continual rain, which has claimed seven lives in the past week and dumped more water on Nicaragua than Hurricane Mitch did in 1998, President Daniel Ortega declared a nationwide state of disaster Oct. 19, mobilizing various state and municipal bodies to go into disasterresponse mode. Ortega signed the decree after hearing damage assessments from various civil and military disaster-response organizations. Also on hand was Venezuela’s National Emergency Council, which was sent to Nicaragua last week by President Hugo Chávez to assist in the response and reconstruction efforts under the auspices of the Bolivarian Alternative for the Americas (ALBA). “We will work in the coming days to do everything that we can do,” Chávez told Ortega during a phone call from Caracas. In a month and a half of daily rain – starting Sept. 4 with Hurricane Felix – a total of 109 Nicaraguans have died, 135 are missing, 22,000 homes damaged or destroyed and more than 37,200 families otherwise affected, according to official damage reports. Thousands of people from Matagalpa and Estelí to Granada and Managua, have been relocated to shelters. , isolating the country from the rest of Central America. The material damage is already reported to be massive. According to preliminary assessments, 155,000 manzanas of crops have been lost, 45,000 heads of livestock killed, 3,000 kilometers of road damaged or destroyed and nine bridges washed out. Matagalpa was turned into a disaster zone last week when the Río Grande overflowed its banks for the second time in two months, rushing through the city and leaving a swath of destruction in its wake. With more rain predicted in the coming week, authorities are expressing serious concern that rivers could again overflow at any moment, and that saturated hillsides could turn into potentially devastating landslides, such as the one caused by Hurricane Mitch on Casita Volcano, which killed some 3,000 people nine years ago this month. 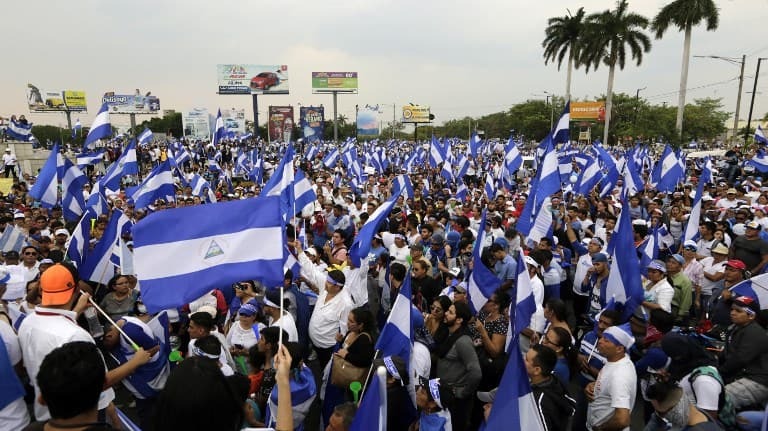 Ortega last week thanked Venezuela in advance for its “historic” and revolutionary show of solidarity with Nicaragua, but said that the country’s ability to deal with the than a month of continued rains that have taken a heavy toll on infrastructure and endangered newly planted bean crops in the northern agricultural region of the country. Gustavo Moreno, director of the Ministry of Agriculture and Forestry’s Zero Hunger initiative, was cautious this week in assessing the scale of the losses. Moreno did admit that there have been some confirmed reports of damage to valuable export crops. Some 70,000 acres of peanut crops have been reported damaged, though the outlook is more positive for the maturing coffee harvest, which will be picked in the coming weeks. Still, the impending bean shortage has many worried. Nicaragua has three growing seasons. The last of the year, which begins in December, is by far the most productive for beans, yielding an average harvest as large as the other two seasons combined. If there are not enough seeds on hand to properly sow the fields for that harvest, there could be worse shortages next year. “We cannot deny (the seed shortage),” Moreno said. A drought earlier this year and a series of ill-timed natural disasters have put future harvests at risk, he added. That looming threat is grave enough to spur a major reevaluation of government trade policy. The Ministry of Development, Industry and Trade (MIFIC) is studying the possibility of opening the borders to largescale bean imports. That would be an unusual move in a country that exported nearly 60 million kilograms of beans last year, some 40% Central America’s total bean harvest. Nicaragua has also begun sending beans farther afield. In April of this year,Nicaragua sent its first shipment of beans to Venezuela under the auspices of the Bolivarian Alternative for the Americas (ALBA), reported daily El Nuevo Diario. ALBA stipulates that bean exports to Venezuela will eventually rise to 2.5 million kilograms annually, though current shortages have not been linked specifically to recent exports to Venezuela. Laura De Clementi, a representative of the United Nation’s Food and Agriculture Organization, said that the resources are available to purchase seeds from abroad if it proves necessary in the coming weeks. Moreno noted that Finland and Sweden have also promised to help fund seed purchases. Back in the Granada market, Mercado leans stoically on her counter.